Click your device to get a quote. 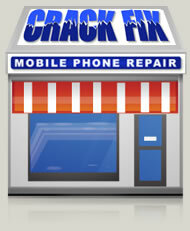 Here at Crack Fix we understand that your phone or device is very important and you don't want to be without it for any longer than you have to. That's why we strive to offer very fast repair services. For walk in repairs you can usually get your device repaired the same day, or even the same hour! At Crack Fix we use the highest quality parts we can find, usually this means genuine original equipment manufacturer components. You can rest assured with Crack Fix, we stand behind all our work. All repairs come with a 3 month warranty on parts and labour. Our unlocks are also guaranteed with a full money back offer if we fail to unlock your device. We offer our repairs at the best prices we can, however we refuse to lower our quality in order to reduce our prices. For posted devices we will repair and post back your device on the same day we receive it. At Crack Fix we use the highest quality parts we can find, usually this means genuine original equipment manufacturer components. We offer our repairs at the best prices we can, however we refuse to lower our quality in order to reduce our prices. We always try our best to give our customers the best support and find them the best solution for their individual needs. Even if that means providing an insurance letter or recommending warranty or RMA over our own repairs. You can come and see us in store or give us a call with any problems or questions you might have with your device, we are always happy to help. We are open for service. Feel free to talk with us. Copyright © Crack Fix 2016. All Rights Reserved.